Notable In-Running Highs and Lows: Missed Approach [14.5]; Mall Dini [1.35]. Comments: GB finally get a winner on the board with Missed Approach leading more or less the whole way with some brilliant jumping. Mall Dini came there at the death travelling strongly but didn't have enough to go past after a gruelling 3m2f. Notable In-Running Highs and Lows: Laurina [1.91]. Comments: Laurina looks like another wonder mare for Willie Mullins as she absolutely annihilates the Mares Novice Hurdle field. Russell's ride in the Mares' - High School Days - being backed across the board as the jockey looks for his fourth winner of the day. 16:24 - ANOTHER win for Elliott! Notable In-Running Highs and Lows: The Storyteller [12.0]; Splash Of Ginge [1.6]; Kings Socks [2.1]. Comments: Russell, Elliott, Irish - was it going to be anything else? Despite hanging right on the run in Davy Russell gets The Storyteller up on the near side to beat Splash Of Ginge. Notable In-Running Highs and Lows: Penhill [18.5] Supasundae [1.76] Sam Spinner [2.94]. Comments: With a dozen horses turning for home with live chances, Supasundae and Penhill end up fighting it out coming to the final flight. After a year off the track Paul Townend gets last year's Albert Bartlett winner Penhill on top after executing a great patient ride. Willie Mullins records his sixth win at this year's #TheFestival as Penhill stays on strongly to win the Stayers' Hurdle @CheltenhamRaces. Notable In-Running Highs and Lows: Balko Des Flos [10.5]. Un De Sceax [1.4]. Comments: Treble up for Gigginstown with Balko Des Flos landing them their first ever Ryanair Chase under another great ride from Davy Russell. 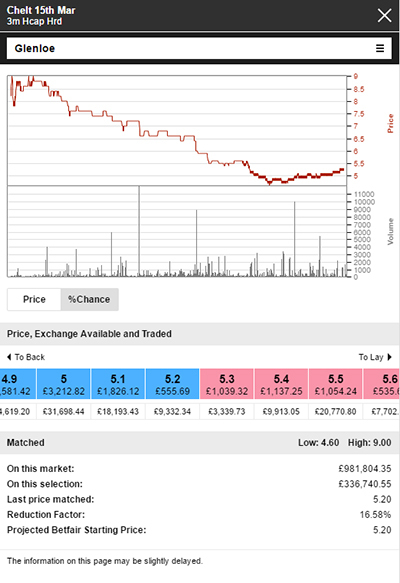 Un De Sceaux tried to fight back but didn't have enough after trading at [1.4] in-running. 14:25 - Can anyone stop Gordon Elliott? Comments: The two at the top of the market fight it out in a strong drive to the line with Davy Russell just getting Delta Work up to beat Glenloe after looking like he had nowhere to go approaching the last. Superb ride! Notable In-Running Highs and Lows: Shattered Love [11.0]; Terrefort [2.0]; Finians Oscar [2.02]. Comments: Shattered Love and Terrefort battle it out approaching the last, despite an untidy jump Jack Kennedy gets his mount to power up the hill providing Gordon Elliott with another winner to begin day three in style. All the latest Exchange market movers are in, and Shattered Love is getting lots of backing in the JLT as Gordon Elliott attempts to build on a superb Day 2. 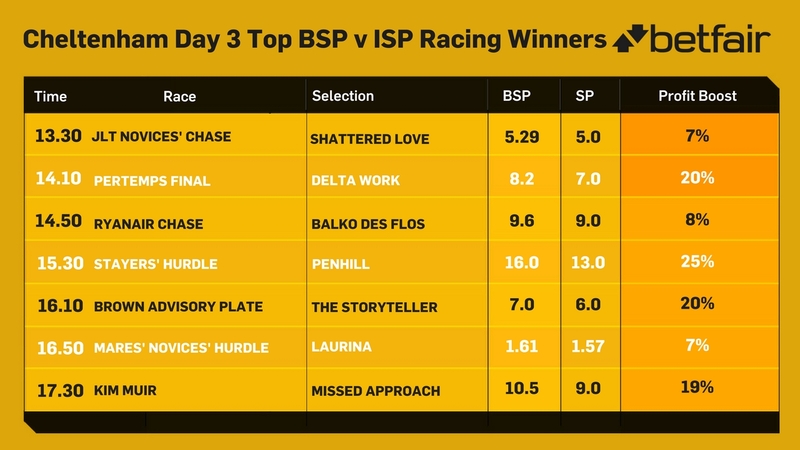 The Exchange offered the best price for every race on Day 2, with particularly big differentials with ISP on the Coral Cup and the Fred Winter. While Altior was the gutsiest performer of the day, it has to be left to Presenting Percy to take the award for the best clock performance of the day, and probably the entire week. As the visual impression suggested, they went a searching pace throughout, with Black Corton, Monalee and Elegant Escape all falling victim to being up with the pace early. Monalee in particular has to be upgraded as he was keen throughout - he clearly possesses a very high cruising speed - and to get within seven lengths suggests he's a bit of a monster himself: he would almost certainly have won the JLT had he turned up there and could well be a Ryanair winner in 12 months. Today's run was certainly in the 165+ range and can be upgraded for the reasons mentioned. Presenting Percy was supreme though. He travelled and jumped beautifully, given the most brilliant pace-efficient ride by Davy Russell. The overall sectional profile of the race was very strong: they were 4.5 seconds faster than in Coo Star Sivola's race on Tuesday to three out, and still 2.5 seconds from there to the line. Even lined up against Altior - who ran over a mile shorter - the numbers come out well, albeit the Champion Chase was steadily run. I would be absolutely certain that Presenting Percy ran to a mark somewhere in the mid 170s yesterday, and he's probably the best staying chaser around. If Pat Kelly can keep him in this kind of form, he'll win whatever races he wants next year - 2019 Gold Cup market anyone?!? Day two was a cracker and we witnessed a notably brilliant clock performance by Presenting Percy (more on that later). Day three - St Paddy's Day - has the added bonus of two championship races, and it's from those that I'll be making today's selections. In the Ryanair Chase, Un De Sceaux is the correct favourite, but is short enough now and, for all he wants soft ground, I'm less certain that he wants a stamina test at this trip, which it will turn into with the ground today. With no Ruby to settle him, I'm keen to take him on. I've always liked Cloudy Dream, who ran a solid second in the Arkle last year, following that up with a 160-something performance when finishing in the same position behind Flying Angel at Aintree over the intermediate trip. His campaign this year has been frustrating. He was an excellent second to Smad Place at Aintree (racing off a mark of 155) and putting in a similarly good clock performance. Then, frustratingly, the Jefferson/Hemmings team decided that his future lay over three miles, and he's been tried at that distance in two starts since. As a horse whose strength over two-and-a-half miles was his ability to travel, and quicken, the move to three-miles was a very strange one for me, and that seems to have been borne out by how he's shaped in those two races. That said, his latest run behind Native River actually looks pretty good form in the context of this: he travelled brilliantly, and was ultimately outstayed by a tougher, better horse over that trip. Over shorter today, I'd be confident that he can jump and travel quietly through the race and be produced late. Whether he'll consent to go past is another question and as such I'll be backing him both win and place. In the blue-riband event, the Stayers Hurdle, Sam Spinner is my strongest fancy of the week, relative to price, so I'm not surprised to see him starting to shorten now. This race reminds me quite forcibly of the 2012 edition where the tough, genuine, strong-staying Big Buck's was up against half a dozen pacier, stronger-travelling, non-stayers and put them all to the sword, winding the pace up a long way out. The obvious difference being that Big Buck's was sent off at odds-on and you can still get [4.7] on Sam Spinner now. His performance at Ascot was exceptional on the clock, he's improving for every run, jumps, travels and gets the trip better than any of the other main protagonists. He basically looks the ideal type for the race and, yes it's an old cliché, but if he was trained by Willie Mullins he'd be a 6/4 shot. You have two concerns with him, which are factored into his price: he's never run at the Festival, or an event like this, and may find the hustle-and-bustle of the Festival experience getting to him and causing him to boil-over; he was slightly unsettled at Ascot last time out pre-race. The other, more substantive, concern for me is how the race is likely to pan out. They're going to go a strong gallop, he's going to be in the vanguard and find himself under constant pressure from the pacier, 2-and-a-half mile horses (Yanworth, L'Ami Serge, Supasundae, Wholestone, The Worlds End to name a few) who are going to move upsides him going well. For all he's tough and genuine, all it takes is a mistake under pressure to put him on the back-foot and get caught out. As I say though, that's factored into the price, and I wouldn't be keen to be a layer at anything bigger than 6/4: he's clear on form, is the strongest stayer and has the best profile to boot. I'd be very hopeful, and he remains my NAP of the meeting. Scroll to the end for my recommended bets. Good morning and welcome to another Betting.Betfair Cheltenham Festival 2018 live blog. It's St Patrick's Day, which means that win, lose, or dead-heat the Irish will be out in force having a great time, with the feature race being the Stayers' Hurdle at 15:30, where Jessica Harrington, and not Willie Mullins, has the leading Irish hope in Supasundae. Day two was a great day for Gordon Elliott as the Betfair Ambassador saddled a treble, including the brilliant Samcro in the Ballymore Novices' Hurdle. Elliott has some strong chances on the third day of the Festival too, so you'd be crazy not to check out his exclusive thoughts on all his St Patrick's Day runners.